The W’s Passport to Wellness joined the culinary arts team this semester to educate students, faculty and staff on creating healthy snacks. On April 25, the ninth session with Passport to Wellness took place, and there were only five empty seats in the classroom. 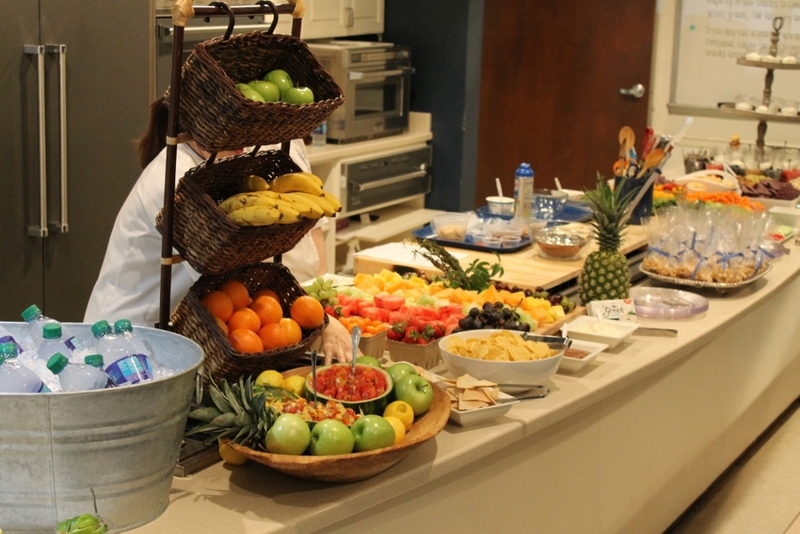 Mary Helen Hawkins, a culinary instructor, shared a buffet of goodies with participants before allowing three of her students to demonstrate the recipes. The snacks included trail mix, smoky chipotle guacamole and pineapple salsa. Those attending were enthusiastic about learning and tasting foods that are healthy while still being easy to make. Everyone else was equally enthusiastic about teaching. There was even a hand-made watermelon lizard joining in on the fun. Dane Guadagno, one of the students assisting Hawkins, feels that the healthy snack teaching sessions are giving him and the other students real-world experience. The entire team is very excited about the numbers of people who have been attending the sessions this semester. “People have been waiting for extra seats at the next session, and there haven’t been any,” Guadagno said. Ariana Jones, a culinary student at The W, served as the sous chef during the April 25 session. “It is a challenge to make healthy food taste good,” Jones said. With her aid, those attending were even able to have fun at a s’mores bar. She was ready to answer any questions from the class. Participants received a pamphlet of recipes and educational readings. The material also included tips such as only eating snacks if you are hungry and keeping snacks nutrient-dense. This is the first semester Passport to Wellness has done such an event for The W. The group is looking forward to co-hosting more food sessions with the culinary institute in years to come.